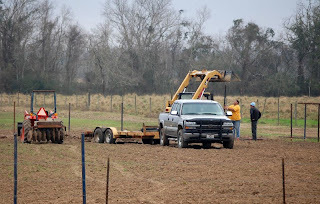 Last weekend the boys brought out the big guns and got to work on trying to get our top rail up on our arena. 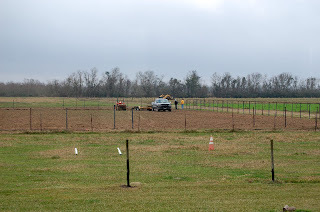 They first had to get the roping boxes all measured out and those posts put in the ground. Then they had to finish putting the last corner in. We have decided to round our corners and that takes some extra welding time. But I think it will be worth it in the end. 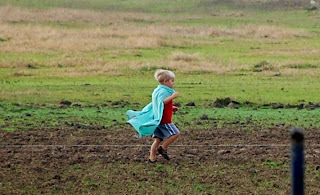 Little Cowpoke put on his "Superman Cape" and went out to help work. Never fear, Little Cowpoke is near! He would run back and forth, "helping" the big boys work. 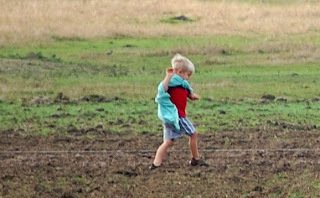 Little Cowpoke is always wanting to help out and get in there and get his hands dirty. He calls himself a "Working Man". It also helps to throw dirt clumps. Just look at the green grass trying to grow! Super crazy grass!! Don't you know it's January? That is my view from my back porch. I hope I don't regret having all that dust and dirt so close to my house! I wanted to be able to watch everyone ride their horses from my air conditioned house!! Whuahhahaaa!! Who am I kidding, I am going to defiantly be out there in all that dust and dirt! Cowpokette wishes she could be out in all that dust and dirt too! She is pointing to her Daddy wanting to go out with him. But she is still in her pajamas! I told her, "no", so she turned around and tried to find a way there herself. Here I was telling her, "NO!!!" and she just sat there shaking her head and saying, "Uhhh". 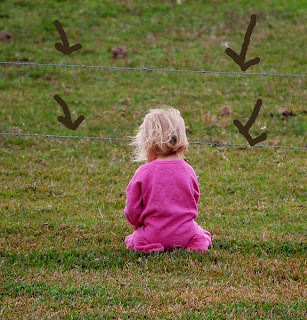 She was going to crawl under the barb wire. Little Stinker. Then she tried to act like she wasn't interested in going under the wire. She was just sitting there picking grass. Yeah, I almost fell for that. Not quite!! See Belle? She is looking at me because I was standing there yelling, "NO! You come here right now!!" Cowpokette finally gave in and came back to the house. The men worked all day long. 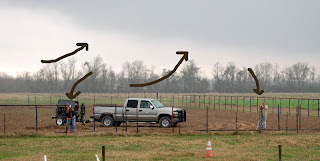 They were trying to get all the welding done before the rain came. 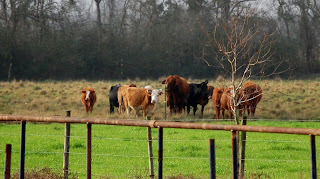 The cows and one bull were all looking and wondering what in the world those crazy men were doing! I love how curious cows are. Then at about 2 in the afternoon the storm clouds started moving in. What is really cool about living in the south is you can actually see fronts coming. Can you see this one? And sometimes you can see fronts coming when you are driving, and you will be in the sun and then just ahead of you it will be pouring rain. It's really neat. But You can see the two arrows pointing to Mr. Cowboy and his Dad trying to weld like mad men? Then the rain came!! 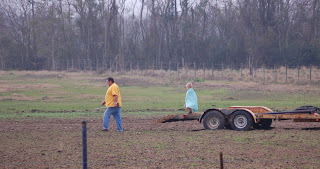 It first started sprinkling and they kept working. But that didn't last for too long. Then the flood gates were opened! And he was STILL working!!! Isn't that dangerous? 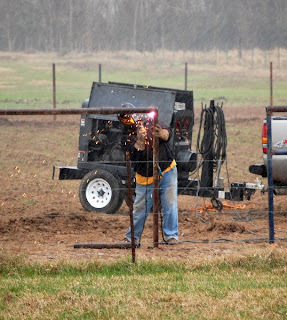 Welding in the rain? I don't know too much about welding, but to me that seems dangerous. But they got just about all of the top rail finished. We have one more corner to weld and about 80 feet left of top rail. Hooray!! I am so excited. Watch out horses, here I come!! And if y'all want to win a really cool necklace, head on over to Holly Lane's blog, Simply Undecided!! She is haveing a 100th blog post celebration and giveaway!! So, head on over there and check out her awesome blog and tell her congrats on 100 posts!! I'm so coming out one day to see your horses! How awesome to be able to amble out your door and be right there with all of that space and openness! That's gonna be awesome!! Go guys!!! Won't be long and you'll be riding and roping for the spring! Wish I were closet I would come and break in that arena for you;)!!! Thanks for the mention today! I love the pink PJs...You really can see the weather coming in..but you need more snow....LOL.. It's amazing to me how fast the arena has gone up while you still have wires dangling out of holes in your walls. Hmmm. Maybe that momentum needs redirected? Hey, Lily and I were looking at your blog the other day. She wants to come out and see your horses one day. She would love to be able to ride one. Could I bride the horse owner with something? It sure would make a little girls day!! Monday IS MLK Day. Are you busy? I just got an email from the lovely people at English Toffee Anytime asking if I'd like to do a giveaway-- thanks for recommending my site! I LOVE doing giveaways and what a fabulous product! I really appreciate it. Thanks again & enjoy your weekend! 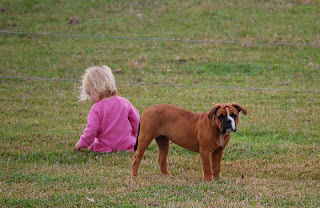 Andrea I got chills up my spine when I saw Cowpokette near the barbed wire.... I wasn't quite so 'barb savvy' when I was her age... I ran right into it. big huge ouch! The arena is going to be amazing!! I would love to have one that close to my house. Great areana you got going there! Cowpokette wouldn't ever crawl under the barb wire!?!?! I know it is cool to see that! One time you could look across the road and see the rain pouring down, lighting, the whole works and I'm standing in the sun in my yard! Crazy!! It got cloudy this afternoon here, but we didn't get any rain though. 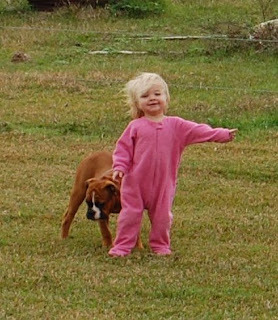 Cowpokette is adorable in her pink PJs. That is going to be an awesome arena. How exciting! 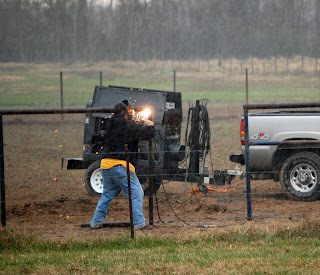 A good thing about welding in the rain is that it won't start any fires. Happy for you and your coming-along-nicely arena! What tough dudes welding in the rain. Love the top pics with Belle and your daughter. They are both way too cute!!! Cowpokette reminds me of myself when I was little. When told no, I'd just smile sweetly and do it anyway. lol! Youre'going to have a great arena there...and awesome views from your house. Awww... I want an arena! Hard to convince hubby of that when we live right next to the Clayton Fair Grounds - and there is a perfectly good arena 5 min away. (pout).